As I’ve mentioned my faithful old 300D is broken. 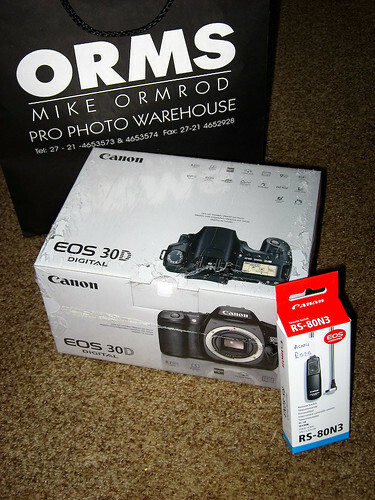 Today Mela and I went off to Orms and she bought me a 30D as an early birthday gift (my birthday is on 19 May). I haven’t really used it yet because we were out most of the day but the few shots I took amazed me with the sheer speed of the 30D, compared to the 300D. This entry was posted in Photos and tagged Camera, Photography. Bookmark the permalink. congrats on your birthday and also on a great camera! btw, does the box + camera comes with a kit lens (ef-s 17-85 usm)? Thanks Thys. No I just got the body. I already have several lenses and while I would like to get better quality ones, this will have to wait a while.